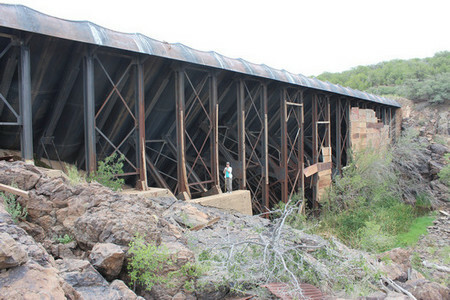 In 1897, approximately 4 miles east of Ash Fork Arizona, a dam of revolutionary design was erected by the Wisconsin Bridge and Iron Company for the Santa Fe Railroad to impound the flood waters of Johnson Canyon. That dam was made of steel, rather than the conventional dam building materials of earth, stone or concrete. 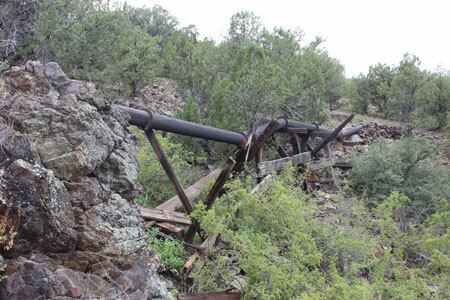 The impounded water was piped to Ash Fork for use by the railroad in its steam locomotives. 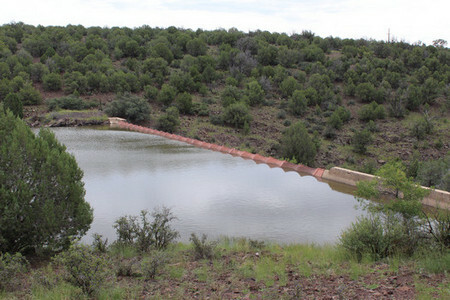 The dam, designed by F. H. Bainbridge was the first large sized steel dam constructed in this county. It is still standing and doing its intended job more than 100 years later. 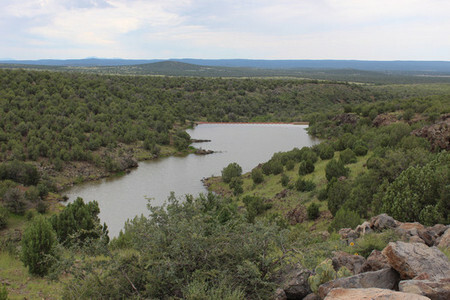 The steel portion of the dam measures approximately 184' in length. Two concrete and stone abutments on either end bring the total length to about 300'. The maximum height is 46'. The basic structure of the dam consists of 24 frames arranged in a right-triangle configuration. 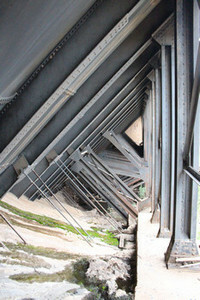 The inclined legs of the triangles are made of 20" I beams anchored in the bedrock. The vertical legs are anchored to concrete foundations. 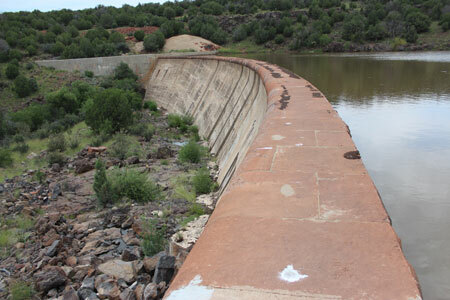 The face of the dam is made up of steel panels that are 3/8" thick and slightly over 8' wide and 8' long. They are curved into a concave shape. 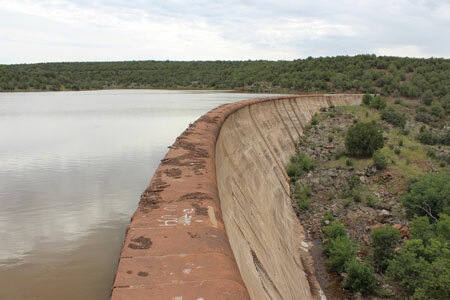 From the water side of the dam, the panels form a series of vertical troughs or channels. The panels were riveted together and their edges were riveted to the flanges of the I beams. There were no spillways at the dam. It was designed to overflow. Aprons installed at the crest of the dam direct the water outward from the base. Large boulders were placed at the base to disperse the falling water and reduce erosion. The close-up view of the aprons shows the riveting pattern that was used to allow for expansion and contraction. 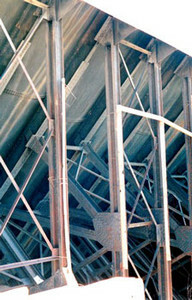 The triangular frames were braced together in pairs as seen in the photo below. This was done to reduce lateral movement in the framework. 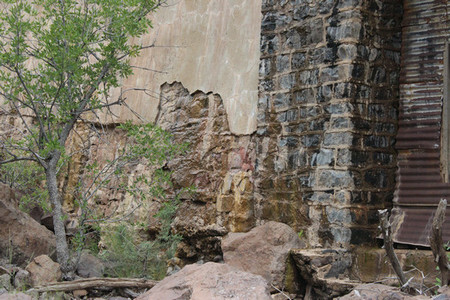 The two photos below show the detail in the stone/concrete abutments. It apparently took some effort to figure out how to get a good seal between the steel and the stone/concrete. Historic photos of the dam show the entire downstream side of the dam covered in corrugated sheet metal. Today only a few sheets remain. 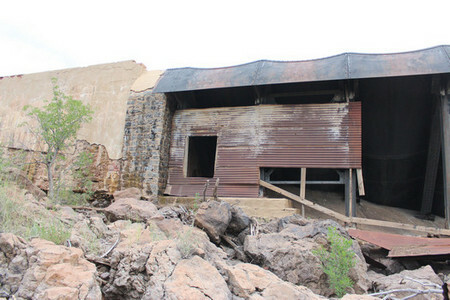 That covering was intended to discourage visitors from wandering around inside the framework of the dam. 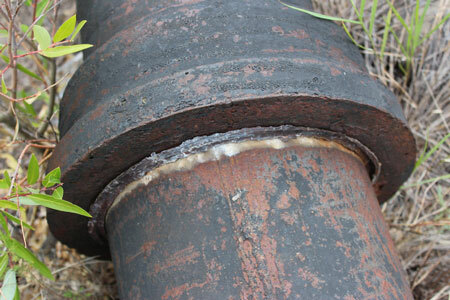 Water from the dam was directed into a 4" diameter pipeline that ran approximately 4 miles to a water tank in Ash Fork. 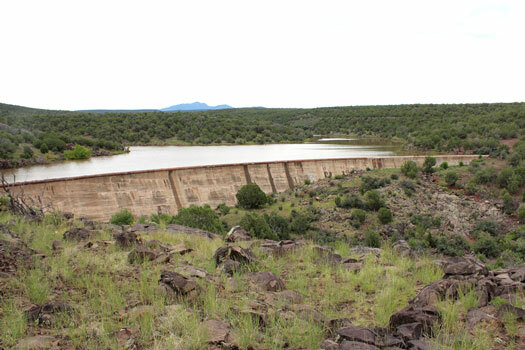 In 2000, the dam was designated a Civil Engineering Landmark. 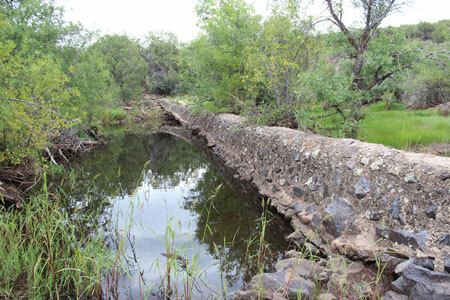 In 1911, a second dam was constructed about a mile upstream from the Steel Dam. It was built of blocks of quarried sandstone. 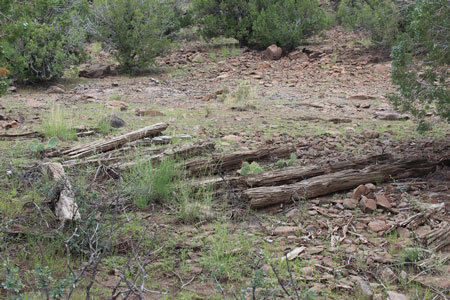 A spur line was constructed down to the dam site and the blocks of sandstone and other materials were brought in by rail car. 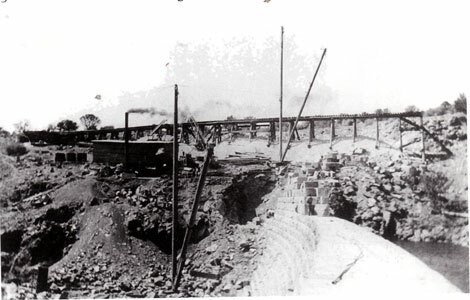 The photo below taken during the construction of the dam shows the blocks of stone. 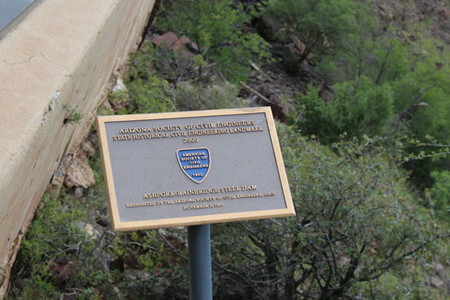 As in the construction of the Steel Dam, there were no spillways built into the Stone Dam. It was also intended to overflow. When my wife and I were here in August of 2013, there was evidence that had recently happened. 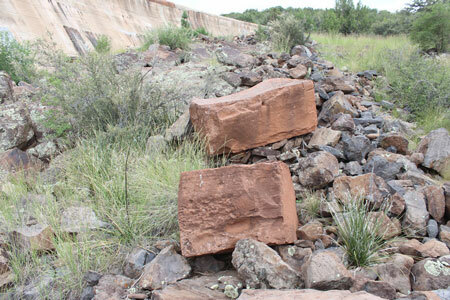 Large boulders and unused sandstone blocks were dumped near the base of the dam to disperse the force of the overflowing water. The pattern used in the setting of the standstone blocks on the lip of the dam can be seen in the photo below. The lighter colored pile of material in the distance is left over crushed rock that was used in the concrete mix. 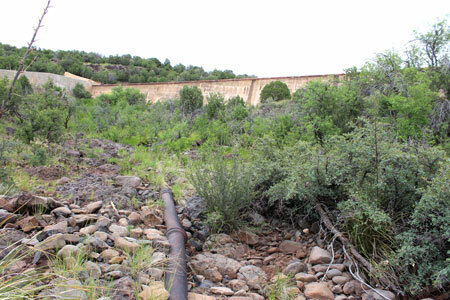 It appears that the output of the Stone Dam was taken from its base and transferred downstream through a large diameter iron pipe. I do not know where the water ended up. Was it simply dumped into the lake behind the Steel Dam or somehow connected to that dam's discharge system? 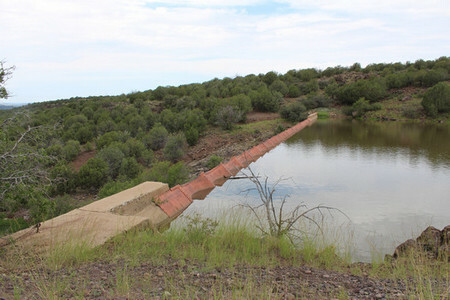 Remnants of the old spur line can be seen on the north side of the dam. 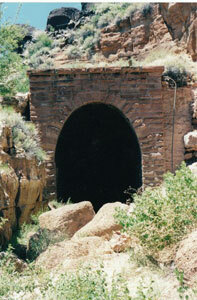 A few miles to the east of Stone Dam in a very steep, deep and narrow part of Johnson Canyon is the infamous Johnson Canyon Tunnel. 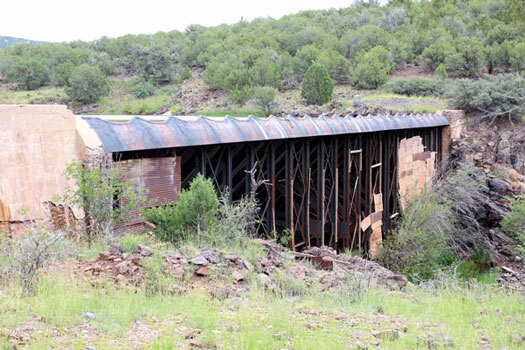 Constructed around 1881, the steep grades and the tunnel itself were very troublesome areas for the railroad throughout its history of use. There were tunnel fires, de-railments, and rockfalls on the track. 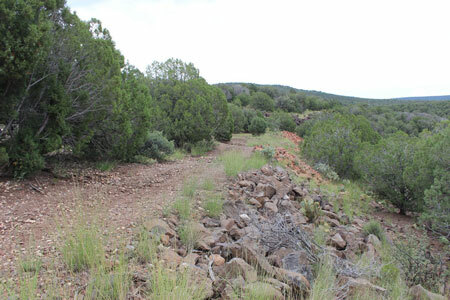 In the 1960's the track was routed away from Johnson Canyon. 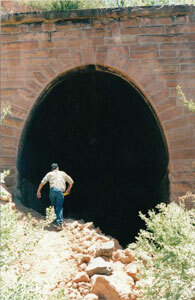 These photos of the tunnel were taken when I visited the area in 2003 or so. I have been told that the only real difference these days is that you are no longer allowed to drive the old roadbed up to the western portal of the tunnel. 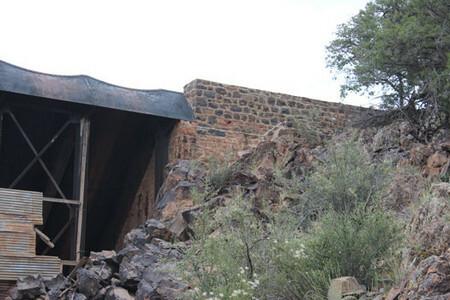 The photo on the left is the western portal to the tunnel. The photo on the right is the eastern entrance. The rock facings were added to the portals after a tunnel fire in 1898. 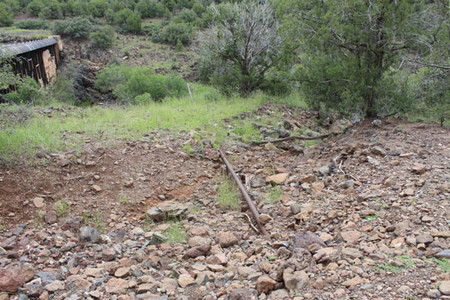 The photo below shows the old roadbed on the north side of Johnson Canyon just below the Johnson Canyon tunnel. 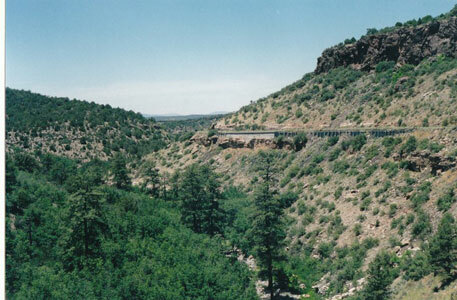 The Johnson Canyon area can be accessed from the Welch Interchange north off of I-40. I believe that the Steel Dam is administered by the Forest Service and the Stone Dam is administered by the town of Ash Fork. They are open to the public for recreational use.